Generates leads worth £160 Million! 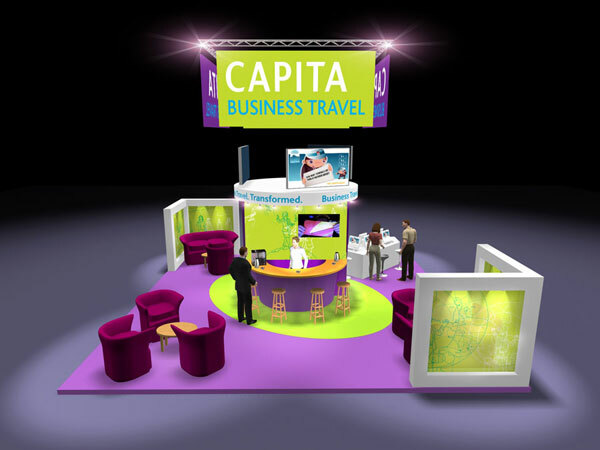 Brief: After Capita's successful acquisition of the business travel specialist Lonsdale Travel, Capita wanted to launch their new brand at the Business Travel Show. Their main objectives were to be noticed, connect with their customers in a vibrant and unique way and generate new leads. Our Response: A design that reflected a travel theme was conceptualised using a very simple compass image. 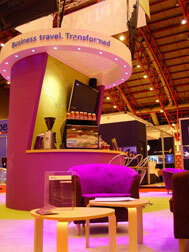 We combined this concept with the latest technologies and delivered an innovative energy efficient stand. 62" plasma screen's were rigged above the stand playing out a looped motion graphics presentation, whilst a travel quiz was used to entertain visitors whilst assisting the sales force in getting customer leads. We worked closely with Capita to ensure the stand kept their carbon footprint very low; fresh fairtrade coffee was served by a barista, low energy LED lighting was used throughout the stand and all the graphics were printed on fabric. Result: Capita secured over £160m of new business leads. The quiz created large queues of customers who enjoyed coffee and hand made fairy cakes whilst they waited! An holistic stand design was delivered and the overall stand reflected the 'we do things differently approach' that Capita pride themselves in having. Click on the images to expand! Click back to return to the Gallery.